One of the hallmark features of Windows 10 when it was first introduced was deeper integration with Windows Phone (or as it was later renamed, Windows 10 Mobile). Unfortunately for Microsoft, no one uses Windows phones. Now the company has announced 'Microsoft Graph,' a service that aims to integrate your PC and mobile workflows seamlessly. You may recall that last year's Windows 10 Anniversary Update added Android notification mirroring, if you had the Cortana app installed. Microsoft Graph is another step in that direction. For example, Microsoft showed someone using the Windows 10 News app reading an article, but had to leave for an appointment, so they turned off their laptop and started using their iPhone. A few moments later, Cortana sent a notification with a link to the article they had open, for later reading. 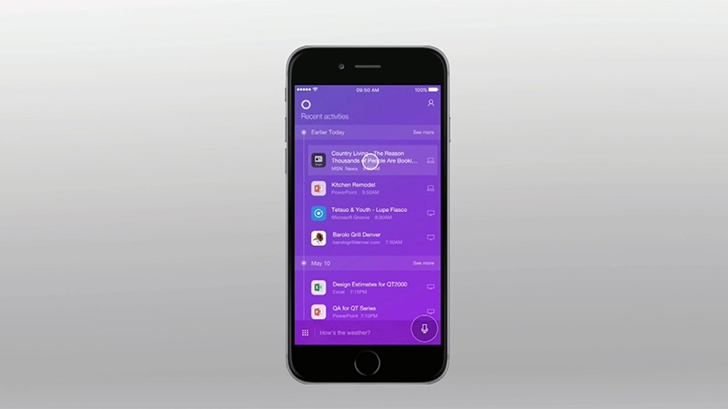 Another feature is the Timeline, which shows everything you have been working on across all your devices. For example, let's say I was working on a Word document a few days ago on my laptop. I could open my Timeline from my Android phone, go to that date, and open the document with Word for Android. Finally, your clipboard can be synced across all your devices with Graph. Developers will be able to integrate Microsoft Graph into their own apps (on both desktop and mobile) once the public API is available. Since I don't use many Microsoft applications or services, I'll be more interested in what third-party developers use it for.